Author: Kebede Hordofa Janko. Series edited by: Hans-Jürgen Sasse †, Mauro Tosco. 18 pp. Roman, 249 pp. The Oromo language (or Afaan Oromoo) of Ethiopia, Kenya and Somalia belongs to the East Cushitic language family of the Afro-Asiatic phylum. Within the present day Ethiopia, Afaan Oromoo is spoken by about 40 percent of the population and is used as a language of inter-group communication in several parts of the country. The present book is a comparative study of the Afaan Oromoo dialects spoken in Ethiopia and Kenya. Whereas the Kenyan varieties of Afaan Oromoo have been fairly well studied, there is no parallel work on the varieties spoken in Ethiopia and the complete genetic classification of the Afaan Oromoo dialects has not yet been achieved. The purpose of this study is, therefore, to determine the genetic relationship between the varieties spoken in Ethiopia and Kenya and to accomplish the internal subclassification of the Oromo language. Drawing on language material from earlier publications on the Kenyan varieties as well as on the author’s field data, the study adopts the comparative method, internal reconstruction and the generative grammar approach. 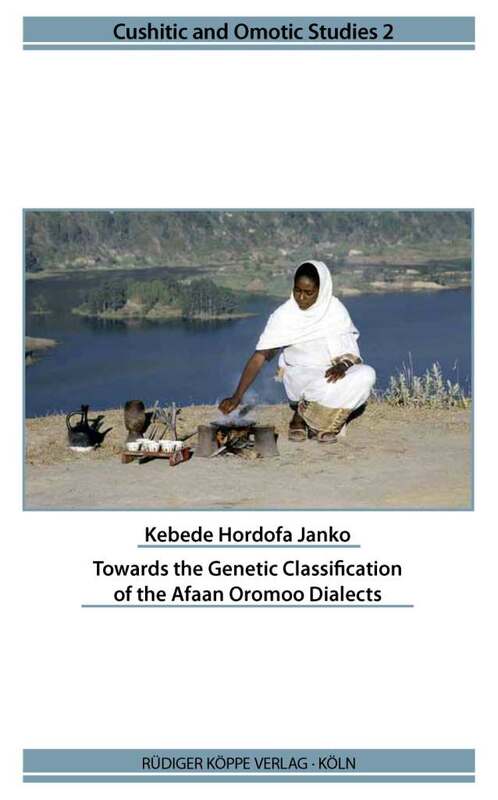 The author assembles cognates, establishes sound correspon­dences, and reconstructs the Pre-Afaan Oromoo forms from the isoglosses (or reflexes) attested in the local dialects. Furthermore, the linear and non-linear approaches are employed to describe the process that leads to the different isoglosses (or reflexes) in the dialects from the reconstructed Pre-Afaan Oromoo form.